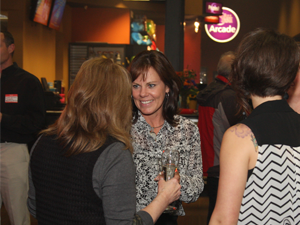 All Star Lanes & Casino is an exciting venue for your next party, company event or group gathering. With 40 bowling lanes, an expansive arcade, and a full-service menu featuring lane-side catering and experienced staff, we’re here to make your event one to remember. We can serve groups from 10 to 200. Customize your event with a variety of food and presentation options. Explore our group event menu and group appetizer menu or order items à la carte from All Star Diner. Either way, All Star has the entertainment, food, and fun to make your event a complete success. For custom event scheduling, pricing, or additional information, please call (360) 692-5760, or use the contact form on this page. Keep your planning simple while maximizing the fun! If your group size is 25 or fewer people, consider an established party package. Use the buttons below for details on each of our super easy party packages. Youth and adult party packages can be reserved conveniently through our online reservations system. Please note: With the exception of birthday cake, outside food or drink is not permitted in All Star. Thank you for your consideration! Interested in having your party or event at All Star? Send us a message to get the ball rolling!